Vélo Vogue: Give it up for Mom! After decades of not riding, and then two partial and THEN two FULL knee replacements, my mom is finally back on a bicycle. Give it up for Moms! 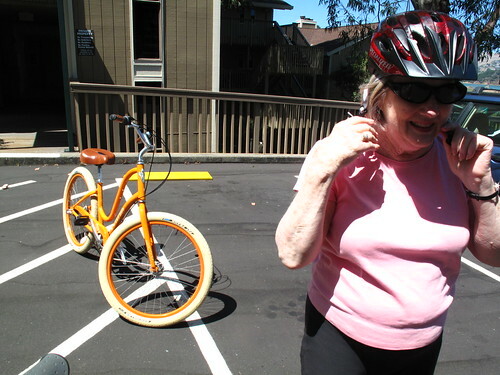 We went for an inaugural spin around her neighborhood this past weekend on the bike I bought for her almost a year ago, right before her second knee replacement. Since then, it's been sitting idly in her living room or on the deck, kind of like the holy grail. Recently, after a few months of physical therapy, she told me she was ready to get back in the saddle. My mom was the first person to teach me how to ride, decades ago. She on her blue Schwinn Suburban, me on a yellow Schwinn with banana seat and training wheels. And here we are years later, enjoying a bike ride together. If you think your mom will never ride a bike with you again, let this video inspire you otherwise. In about two minutes, riding a bike came back easily to my mom, almost as if she had never stopped! I'm very proud of my mom! Well done, Mona! 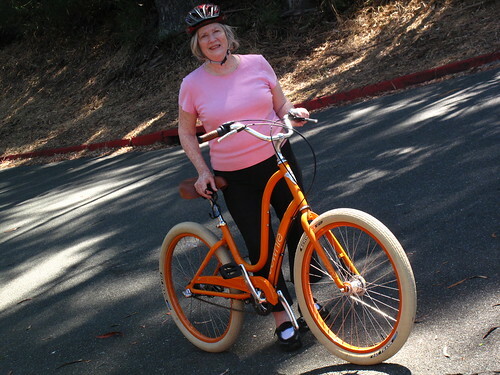 You're looking great -- cute bike, too! All of this after knee surgeries? Yes, my mom is basically a rockstar! Total trooper doing all of her physical therapy religiously and possessing that can-do attitude! That's wonderful. Love the bike, too. Like daughter - like mother? One of the reasons I picked the Townie was for the fat tires. Better sense of balance. She can also easily mount and dismount, and easily reach her foot to the ground when needed. My wife and I gave my mom a folder to ride after decades off the bike, which she rode a few times before she started losing her sight. (Can't ride now.) She and I were doing the same thing, encouraging my mom like you were. I'm sure we were quite a sight, two middle aged women chasing after an older woman shouting "Go! Pedal! Watch out for the curb! Brake!" Definitely will do! Thx for stopping by! Go Mona! So nice to see her overcoming her post knee replacement fears. I think for a lot of seniors it's easy to fall into the mindset that getting older and having some physical problems means an end doing the things they once enjoyed. Nice that she's joining a bike club to keep motivated. bravo mona! back in the saddle! My mom's a crowd pleaser for sure!